This is a direct scan of almost all of a small portion of the tag from a paper punch I bought. 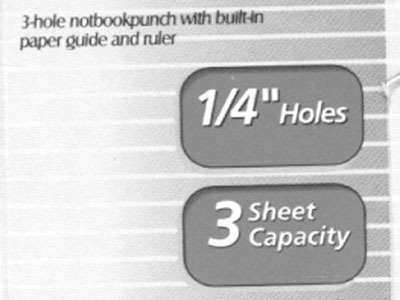 It punches three quarter-inch holes in paper for insertion in a three-ring binder. First, it's kind of funny they think there's such a word as "notebookpunch." Second it's kind of funny they spelled it "notbook." But the funniest part is the translations. You know, how certain words and phrases are displayed not just in English but one or two other languages. For example, you often see DANGER | PELIGROSO, meaning Danger in English and the same thing in smaller letters in Spanish. If you hover your cursor over the scan for this particular model of notbookpunch you'll see all of how it looks.